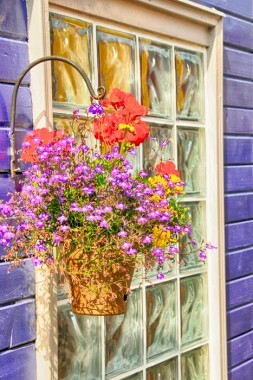 This wonderful window scene was discovered while exploring a walkway between float homes at Fisherman’s Wharf in Victoria, BC. The up close impression of this glass block window framed by painted purple siding, was made complete by the owner’s personal touch – hanging a bucket of joy – for neighbor and passerby to enjoy. Urban renewal Victoria-style.